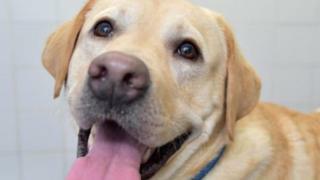 A pet labrador has been described as a "miracle dog" after surviving a 30ft drop onto a rocky riverbed. Chino leapt off a bridge in Glasgow's Linn Park while out for a walk. His owner Elizabeth Brydon thought he was dead as he lay motionless after landing on rocks, due to the low level of the White Cart river. But despite suffering serious injuries including a collapsed lung and severe bruising, Chino made a remarkable recovery. Ms Brydon said: "It all seemed to happen in slow motion. I remember seeing him in mid-air, feeling utterly helpless. "I saw him motionless at the bottom of the bridge and I thought he was dead. "There was very little water in the river, so he fell straight onto the rocks below. "When I didn't see him moving, I thought we'd lost him." PDSA vets used X-ray images to reveal Chino had suffered serious chest injuries but had not broken any bones. He was given painkillers and stayed at the surgery overnight, where he was monitored closely. The animal was then able to return home the next day, so he could recover more comfortably. Chino is now said to be making a "remarkable" recovery, with Ms Brydon "over the moon". She added: "He's my miracle dog." Vet Susan Hermit said: "He is a very lucky dog not to have died that day."